When your shopping for kale leaves, look for firm, dark colored leaves with hardy stems. The smaller leaves will be more tender and milder in flavor. The leaves range in color from dark green to purple to deep red. I prefer the Lacinato or Dino kale with the big, dark green leaves. Store the kale, unwashed, in an air-tight zipped plastic bag for up to five days in the refrigerator. Try it! Preheat oven to 250°F. 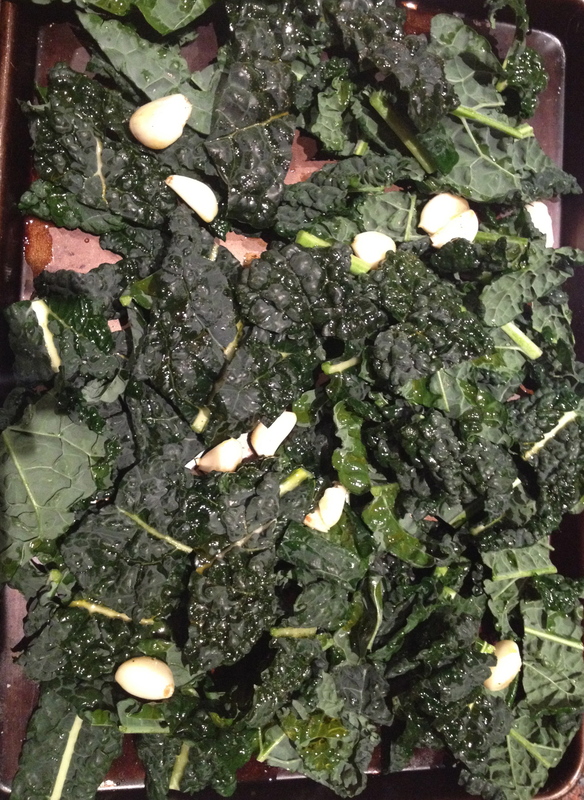 Toss kale and garlic cloves with olive oil in a large bowl. You can use your hands to help coat the kale leaves. Sprinkle with salt and pepper. Arrange leaves (and garlic cloves) in a single layer on 2 large baking sheets. Bake until crisp, about 25-30 minutes for flat leaves and up to 33 minutes for wrinkled leaves. Transfer leaves to a rack to cool. The leaves should be crispy when the kale is done. Hi Marge, it’s on my blog… search for super duper green smoothie!